Greenpeace on Wednesday released its new "Guide to Greener Electronics," in the environmental group ranked Apple fourth among major device makers. The poll ranked 15 companies across three areas: energy, greener products and sustainable operations. The report also challenges companies to reduce their carbon footprint in a variety of areas, and also to set "ambitious" goals for renewable energy. 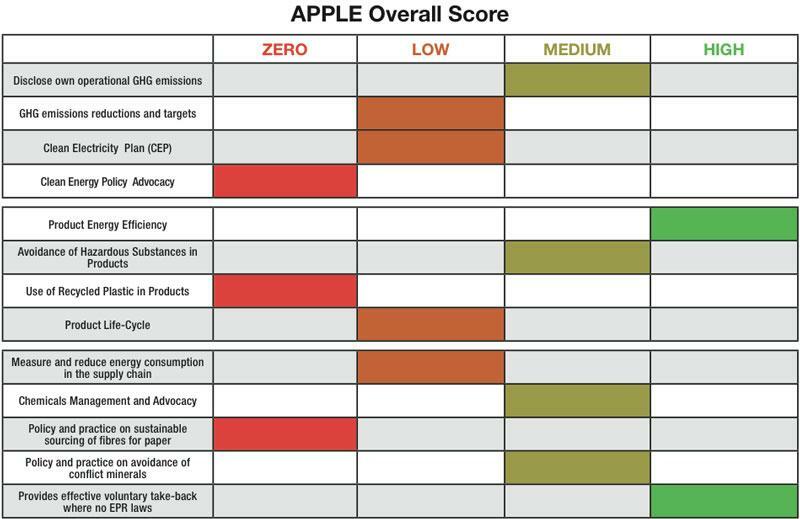 With a score of 4.6 out of 10, Apple came in fourth place —up five places from the previous Greenpeace report. The iPhone maker scored strong on its sustainable operations, but was ranked poorly on energy. Greenpeace said it believes Apple's greenhouse gas emissions data needs external verifications, and the organization criticizes the fact that Apple has not specified any target to reduce emissions. But it also gave credit to Apple for its improved energy efficiency and use of renewable energy. While energy was the company's low point, the sustainable operations category was particularly strong for Apple. Greenpeace credited Apple for exceeding its own goals in global recycling in 2010, and also ranked it as a top scorer for policies and practices on the sourcing of conflict minerals. Apple also had a strong showing in the products criteria, as all of the company's devices are free of PVC vinyl plastic and brominated flame retardants. The company also received maximum points for reporting that all of its products meet or exceed the latest Energy Star standards for energy efficiency. For years now Apple has pushed the environmentally friendly aspects of its products, countering a dispute that began with Greenpeace in August of 2006, when the organization issued a report condemning Apple for the use of toxic chemicals in its devices. Greenpeace also pulled a number of publicity stunts, such as a "Green My Apple" campaign in London in October of 2006, and a "greening" of Apple's flagship Fifth Avenue glass cube in January of 2007. The negative publicity helped to prompt Apple co-founder Steve Jobs issue an open letter to customers and shareholders in May of 2007, in which he admitted that the company had not been forthright on its environmental policy. As part of the letter, Jobs outline a timetable for the removal of toxic chemicals from the company's products, including arsenic, mercury, polyvinyl chloride (PVC), and brominated flame retardants (BDRs). Jobs later said he felt Apple's tight-lipped approach to developing products hurt its image with environmental organizations. He argued that Apple's products has always been green, but previously didn't make a point to mention it in public. Apple now mentions its products' environmental impact with a scorecard at each keynote. Apple's fourth-place ranking in this year's Greenpeace "Guide to Greener Electronics" places it behind Nokia (4.9/10), Dell (5.1/10), and in first place, HP (5.9/10). Immediately below Apple were Philips (4.5/10), Sony Ericsson (4.2/10), Samsung (4.1/10) and Lenovo (3.8/10).